Looking to really reduce your AR double-tap times? 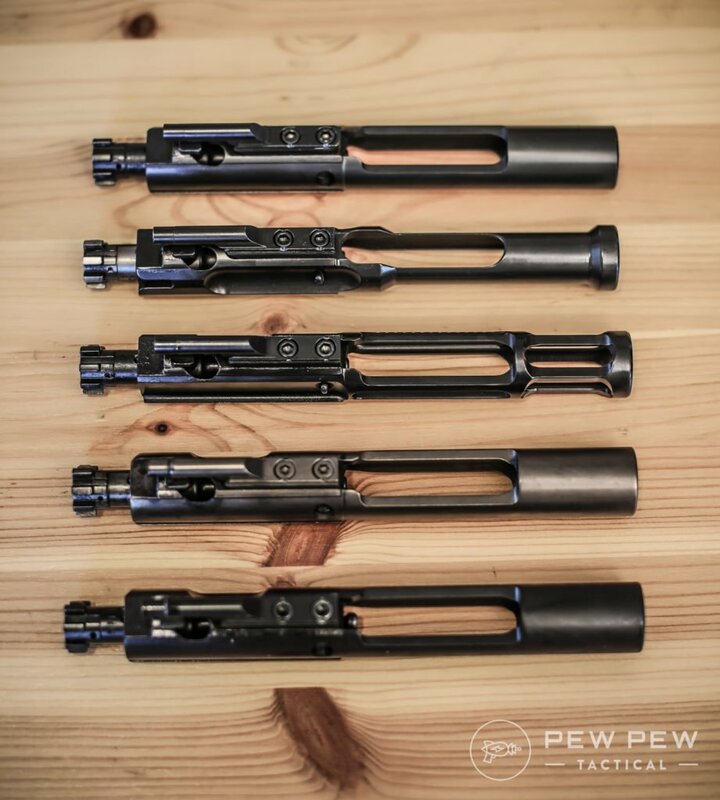 You’ll want to go the lightweight low-mass bolt carrier group (BCG) route. The BCG is the piece of metal moving back and forth between each shot. Lower the weight…and you’ll lower the disturbance to your rifle and sight picture. We’ll cover the most popular ones out right now, other upgrades you should do at the same time, and reliability concerns. Why Get a Lightweight BCG? As we mentioned above…lowering the mass of the primary thing moving around in your rifle is going to help minimize the overall movement. This will let you get back on target faster and reduce the felt recoil. 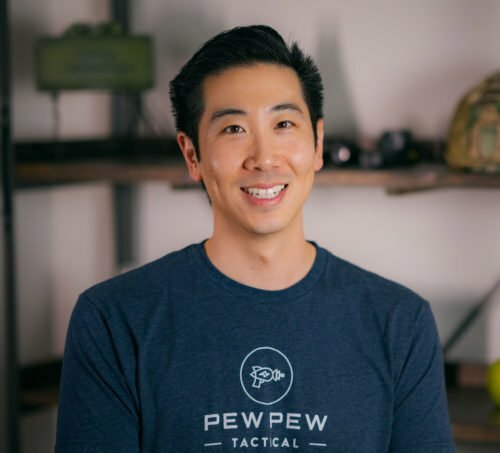 The normal advice is to use the full-auto (FA) BCG compared to the lighter semi-auto BCG when used in rifles where reliability is key. And don’t worry…full-auto BCG’s are perfectly legal. It’s the trigger group that makes something actually full-auto. The extra mass of FA BCG’s keeps things running smoothly in over-gassed AR-15’s that were made to run a variety of ammo and in crappy environments. Since you’re looking at lightweight BCG’s…you’re probably messing around with a secondary AR-15…likely for competition. You probably won’t be scrounging for ammo on the battlefield so you can lower the amount of mass needed to make your rifle still run 100%. What about using the lighter semi-auto BCG? It’s only slightly less weight at 10 oz and change compared to the FA of 11.5 oz…while the ones we’re going to talk about are getting down to the 5 oz range. How Do You Lower the Mass of BCG’s? First…you can cut away “unnecessary” parts of the steel carrier. And second…you can use more exotic materials that weigh less. You’ll see a mixture of these two types of mass lowering techniques in our roundup. Speaking of which…let’s get started! JP was one of, if not the first, major company to sell lightweight BCGs. For a while, they stopped, but now they are back at it again with their Low Mass Operating System (LMOS) models. We’re at around the 1000 round count and don’t see any major wearing…just sweet low recoil shooting. It’s made of steel so it should keep on chugging. Just keep in mind that you’ll lose the use of your forward assist function (who has ever actually used their forward assist though?). *EDIT* I originally stated that this model was aluminum. This new BCG from JP recently came out so we haven’t gotten our mitts on it yet…but we had to include it since it truly is ULTRA low mass. But with great weight reduction comes great cost. Both monetarily and reduced life. Because the BCG is the same material as your upper receiver (aluminum)…it will see some wear and degradation as it does its job…to a point where you have to get a new one. For that reason, JP recommends that you use the Ultra only in competition rifles. It now has forward assist capabilities, but after a couple thousand rounds you’ll have to junk it for a new one. From Faxon, maker of affordable and great barrels comes their lightweight steel BCG. Check out all of those weight reducing cuts! Since it’s steel…the carrier should last almost indefinitely like its semi and full-auto brethren. We’ve been running it in our overall super lightweight build for around 800 rounds and it’s been running smooth as butter. The price is right too at about $200 less than the normal JP aluminum BCG and even less weight. Just good luck finding it in stock! Since at the time of publication the Faxon was sold out everywhere…I’m throwing in JP’s steel version for price-conscious lightweight aficionados. The weight is on par and you’ll save if you scrounge up a bolt from a previous BCG. Thank you, titanium, for bringing the best of both worlds…the lightness of aluminum but the durability of steel. You’ll shave off 32% of the weight compared to a standard BCG, but you won’t run into the wear problems of aluminum carriers. I’ve been running the RCA for over a year (estimate 2500 rounds) in my competition build and I’m still not tired of tapers showing me the touching double-taps I get on targets. A newcomer from Brownells which usually has great self-branded stuff. When you want to try out going lightweight without breaking the bank. Comes in three flavors of Nitride, Nickel Boron (my recommendation), or TiN (gold…yea you know who you are). 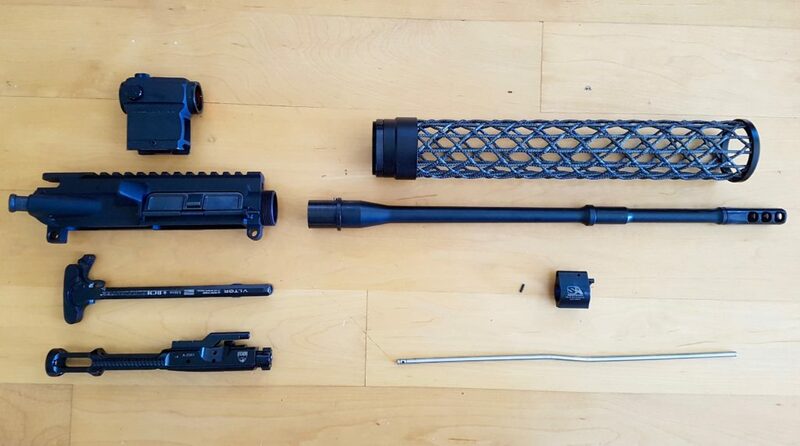 Since the AR-15 is a well-oiled machine where multiple parts have to work together…you can’t just change up 30% of one thing without having to mod others. Here’s what I found to have the best reliability combined with a lighter BCG. Gets rid of the *sproing* of the regular buffer tube spring…and makes your AR-15 feel and shoot SO much better. Especially needed since the standard buffer and spring are too heavy/stiff for your lightweight BCG. Opt for the spring kit if you decide to go this route. I originally got the single pack and needed the lightest spring to go with my RCA BCG. The kit lets you customize things to just how you like them. Not ready to make the jump to the entire system…check out a lighter buffer ($57) and tuned spring ($19). You’ll really want an adjustable gas block since you’ll need less gas to move the lighter BCG. Otherwise, you’ll have a really fast moving BCG which might actually increase felt recoil and damage parts. My pick is for the Superlative Arms gas block (full review) since it has the bleed off hole technology. 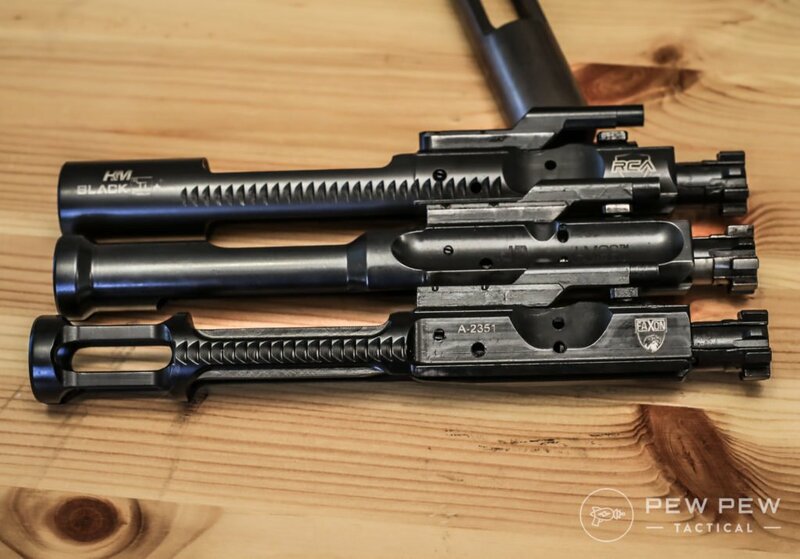 So there you have it…our list of the best lightweight BCG’s on the market right now. Want more awesome AR-15 reviews and guides? Take a look at this! 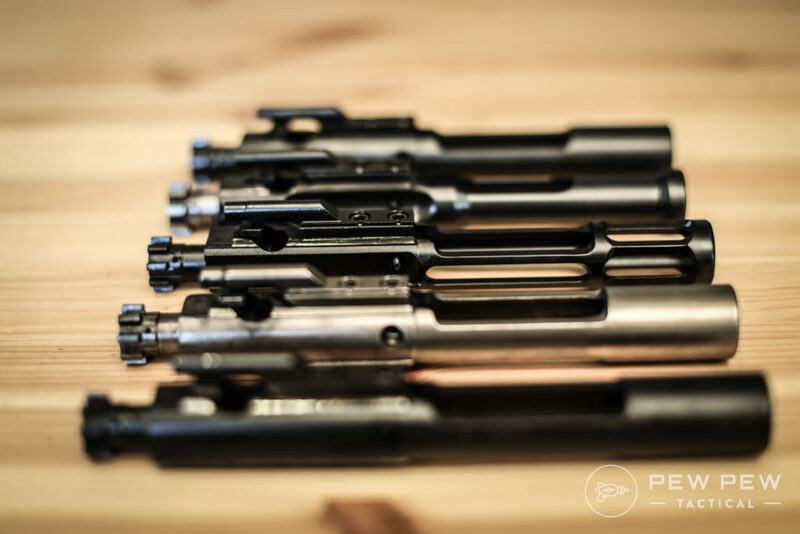 If you have any questions about swapping your bolt carrier group out, how to choose a new one, or you just want to tell others how much better (or worse) you’re shooting with a low-mass BCG, be sure to let us know in the comments below! Being in Canada we have a lot of what you call SBRs, I am having issues with a 10in in 223. I admit I am using bargain NEA barrel, and BCG. I get double feeds and short stroking, stove piping, changed rings and drilled out gas port with some.. 50% improvement but still feel at a loss. 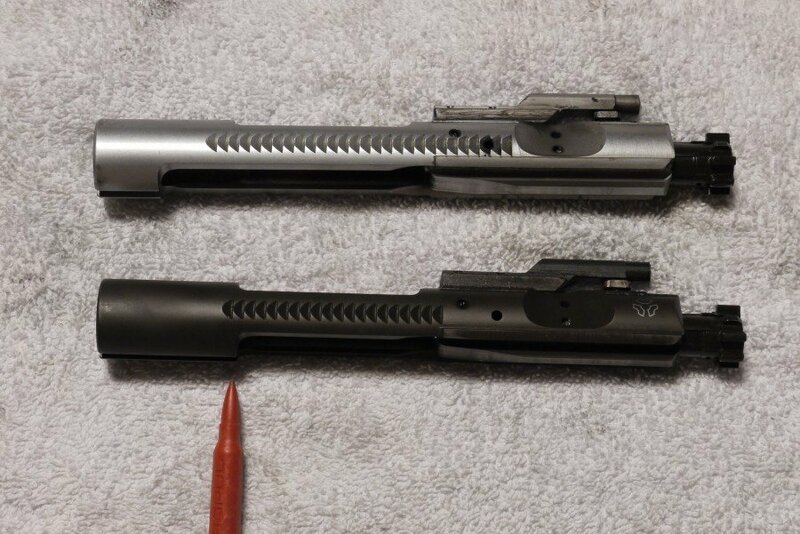 Another gent with a 7,5in said he switched to a semi BCG and bingo, would a lighter BCG and better quality bolt with stronger springs help? Thanks for the reply. I like the idea with the gas Port. I will switch to a 11.5 in barrel or longer to eliminate short dwell time, i have had some success since we talked, switched to Winchester white box (much better) and coated gas rings in heavier oil.. oh gas rings gaps we’re all aligned…. Ahhhh. Also coated BCG and upper in Teflon. That being said i am using bargain parts. Eric, thank you for taking the time to share what you’ve learned. I am starting my first AR15 build, my first rifle in 25 years, and I’ve taken this info to heart. You should do a review on the Brownells reduced weight BCGs! All three flavors; and please cover reliability, wear, coating retention (for NiB and TiN), lubricity, rust endurance for the nitride version, and opinion/review on “how it feels”, as well as how to best combine it with other parts to fully benefit from this BCG (buffer system, gas blocks, etc). If you can pull this off it would be great, thanks! Links of other reviews on this also welcomed…Thanks again! Yup, when we update the article we will get our hands on a few! You say the price is 200 less than the jp aluminium on the faxon and it weighs less. The 1st part of that is correct the second is not i don’t think. For the jp aluminum you say 5. something and the faxon 8. something.